A very detailed and readable account of how walking as a leisure pastime has developed over centuries. This well-researched book by an American writer, walker and environmentalist cites examples relating to urban, rural and wild landscapes. Using the themes of geological features, Macfarlane takes a wide-ranging look at well-known paths like the Ridgeway and more obscure routes in other parts of the world. A very individual and thought-provoking perspective. An exploration of old British routes, their uses over centuries and the people to be met along the way. David Stewart runs WalkingWorld (www.walkingworld.com) which gives members online access to thousands of walks. 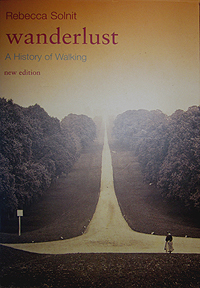 The tongue-in-cheek sub-title of this book is The History, Science, Philosophy, Literature, Theory and Practice of Pedestrianism – a fair indication of Nicholson’s eclectic choice of topics, with an emphasis on city walking. His main interest is the people perspective. Nigel Jones’ guide to the battlefields of WW1 is a practical and evocative account of a personal pilgrimage. Bill Bevan looks at 40 ancient sites in Britain and Ireland, considering their settings and how they were meant to be viewed from the approach on foot to ritual functions.